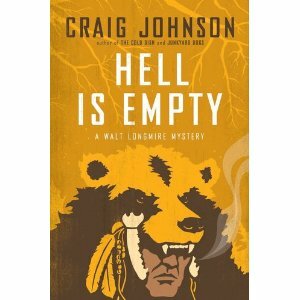 This Thursday, June 2nd, sees the publication of Craig Johnson‘s seventh Walt Longmire novel, Hell is Empty. Maybe it is, maybe it isn’t, but I’ll be first in line at the bookstore to find out one way or another. Walt is the sheriff of Absaroka County in Wyoming, which is a lot like Alaska, a whole lot of empty space, except with roads. His best friend is Henry Standing Bear, aka the Cheyenne Nation, an Indian (certainly not a Native American) who talks without contractions, which makes him sound a little like Data. Walt is three years a widower, with a grown daughter whose phone calls he lives for, and is starting to think about retirement. 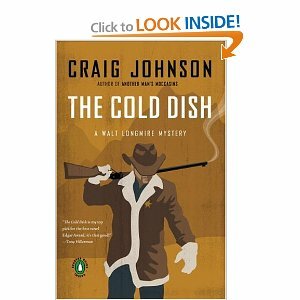 As The Cold Dish, the first novel in the series, opens, a young man is found dead, shot with great accuracy from a great distance with a Sharps rifle. This particular young man, all agree, is no great loss, as he was one of four who had raped a young Indian woman with FAS and didn’t serve near enough time for it. Then the second body shows up and Walt has to call in Omar, the guy with the Nieman Marcus helicopter, for help. I just love a book with a Nieman Marcus helicopter in it, don’t you? The Cold Dish is filled with a wealth of detail about Western history, Indian culture and gun lore (Ever wonder where the term “sharpshooter” came from?) and wonderful descriptions of the landscape, but the true gift is in the characters, including a lot of good-looking, smart-mouthed women and a lot of good-looking, smart-mouthed men who like them. Vic the ex-pat Philadelphia deputy. Lucian the one-legged ex-sheriff. Dorothy who slings the usual at the Busy Bee Cafe. Vonnie the high plains entrepreneur and love interest. Wheelchair-bound Lonnie Little Bird trying to stay sober so his granddaughter can visit him, um-hmmm, yes it is so. Even the characters with walk-on parts are whole people, like Jules Belden, the guy in the drunk tank whose beatdown Walt ably avenges, and that near-giant Brandon White Buffalo who makes lovely sandwiches. Hands down my favorite is retired bartender Al Munro who shows up at the second crime scene dressed in floral print swimming trunks, on a mule, martini in hand. It’s snowing at the time. The dialogue in these novels is so good you feel privileged to eavesdrop in, sort of John Wayne channeling Samuel Johnson, only better read and more articulate. In order, the novels are The Cold Dish, Death Without Company, Kindness Goes Unpunished, Another Man’s Moccasins, The Dark Horse, Junkyard Dogs, and on Thursday, Hell is Empty. Note: Somebody must have told Craig that Chopper Jim took a Walt Longmire novel along on his recent plane ride to California, because Craig got in touch to malign my characters’ taste in reading. And then he sent me this. Pretty sure Jim would vote for Walt if he lived in Absaroka County. If he wasn’t running against him. If you like the flavor of modern western novels and want more, try also Robert Greer’s Spoon, an updating of the Shane story. Then read Monte Walsh, what I consider to be one of the few perfect novels, by Jack Schaefer, the guy who wrote Shane. Then read Molly Gloss’ The Hearts of Horses for a look through a female cowboy’s eyes. It’s almost a sequel to Monte Walsh, which I did not consider possible. All of these novels share a similar rhythm to their language, as if they are told to us from the back of a horse heading into the sunset. They’ll make you nostalgic for a horse you never rode yourself. Update on June 3rd–Here’s the trailer for a pretty good adaptation of Monte Walsh starring Tom Selleck. Worth seeing. I ordered “The Cold Dish” and could not put the book down. Thank you for mentioning it. I have ordered the next three, thus using my book budget up through August of 2026, but who cares? I am so far in the hole on that budget anyway, a little more won’t matter! Delighted you enjoyed it! I’m saving up Hell is Empty as a reward for when I finally get Kate19 out of the house. Dana – thanks so much for turning us on to the Walt Longmire books. As with most everything I do I went all the way and bought all the ones that are out in paperback, devoured them and then handed them over to my husband who read them in record time. We then had to go and get ‘Hell is Empty’ out of the library and read it too. Couldn’t wait. Love the humour as well as the action, settings, all the characters (good and bad) and the mysticism. Thanks again. I’m delighted you like them as much as I do! I am a horrible proselytizer of other people’s books.